Social marketing platform Involver is partnering with Klout, a startup that measures influence on Twitter, LinkedIn and Facebook, to allow brands to interact with and reward their fans on Facebook based on their Klout score. Basically, Involver allows brands to create a Klout widget on their Facebook page that engages users to measure their Klout score. Brands can then see which of their users have the most influence on Facebook and the social web, and reward users for signing-up and/or interacting with the brand. And brands can see which fans have Klout in their particular product area. Klout evaluates users’ behavior with complex ranking algorithms and semantic analysis of content to measure the influence of individuals on social networks. On Twitter, Klout’s influence score is based on a user’s ability to drive action through Tweets, Retweets and more. On Facebook, Klout will examine how conversations and content generate interest and engagement, via likes, comments, and more, from the network’s nearly 700 million users. 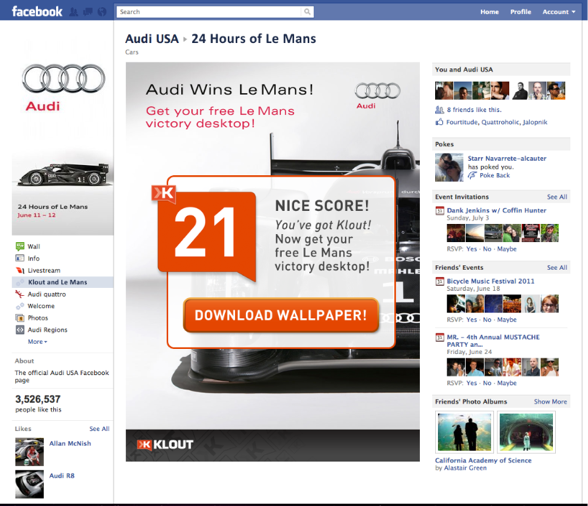 For example, Audi USA has deployed the new Klout app to engage with its nearly 4 million fans on its Facebook page. Fans of Audi will receive a customized brand experience, tailored to them based on their Klout score. On Audi’s Facebook page, fans who sign up to get their Klout Score will receive a reward. The Klout app is available as a free application and will be a part of Involver’s Professional, Business, and Enterprise offerings. Klout CEO and founder Joe Fernandez tells us that this is the most in-depth integration of Klout for the brand experience thus far. It’s certainly an interesting way for brands to actually parse out which of their fans on Facebook not only has ‘Klout’ but also has Klout in a specific area that relates to the brand.